C1499. ISTVÁN KERTÉSZ Cond. Cleveland Orch. 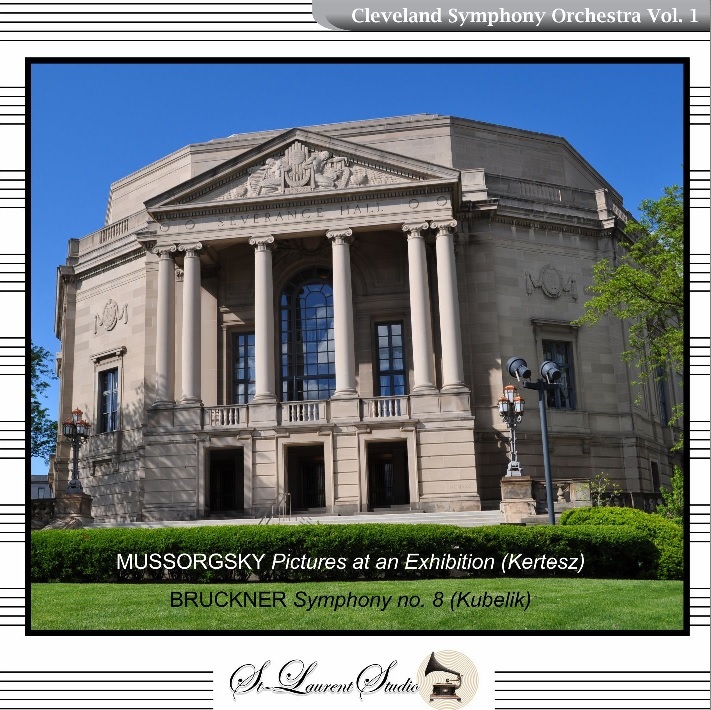 : PICTURES AT AN EXHIBITION (Mussorgsky-Ravel), Live Performance, 25 Jan., 1973; RAFAEL KUBELIK Cond. Cleveland Orch. 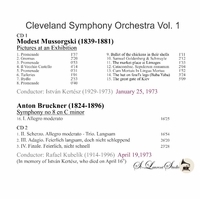 : Symphony #8 in c (Bruckner), [in memory of István Kertész], Live Performance, 19 April, 1973 (both Severance Hall). (Canada) 2-St Laurent Studio YSL T-427. Transfers by Yves St Laurent. "An inordinately gifted conductor, Istvan Kertesz died at age 43 in a tragic drowning off the Israeli coast. He had already reached full maturity as a musician, proving his worth in opera, oratorio, and the symphonic repertory. His interests were wide-ranging, including works from the Classical and Romantic periods and large portions of twentieth century music. Beginning with private lessons in childhood, Kertesz studied piano and violin. He continued with violin training at the Ferenc Liszt Academy in Budapest, adding composition under the supervision of such teachers as Weiner and Kodaly. He pursued his conducting studies with Laszlo Somogyi, at the same time benefiting from studying the performances of Otto Klemperer, who was then working at the Hungarian State Opera. In 1953, Kertesz was appointed resident conductor at Gyor, two years later transferring his activities to Budapest, where he was hired as coach and conductor. Following the political uprising and Soviet response in 1956, Kertesz moved with his family to Germany, subsequently acquiring German citizenship. From 1958 to 1963, Kertesz was general music director at Augsburg. His British debut took place with the Royal Liverpool Philharmonic Orchestra in 1960, followed by appearances with the London Symphony Orchestra in 1961. His American debut came with a tour with the NDR Symphony Orchestra in 1961, during which he made a positive impression on American audiences and critics alike. An appointment as general music director in Cologne came in 1964, and 1966 brought a Covent Garden début, directing UN BALLO IN MASCHERA. A global tour with the London Symphony Orchestra led to his succeeding Pierre Monteux as LSO principal conductor in 1966. In 1971, he became music director of Cologne's Gurzenich-Orchester, a position he held until his death two years later. Kertesz was decidedly non-interventionist as a conductor. With scrupulous attention to the composer's directions, his interpretations were more remarkable for sound musicianship than for striking individualism. Still, his performances often held high drama, and he was intentional about advocacy of works he believed in which, in light of his broad interests, were numerous. At Cologne, he presented the German premiere of Verdi's STIFFELIO as well as Mozart's LA CLEMENZA DI TITO (a work he recorded in its first complete edition on disc). For Decca, Kertesz recorded a superb BLUEBEARD'S CASTLE with Christa Ludwig and Walter Berry, still unsurpassed after several decades. His complete recordings of the Dvorak, Brahms, and Schubert symphonies still enjoy honorable places among the best versions committed to disc. The first Western recording of Kodaly's HARY JANOS (the complete opera) was made with the London Symphony under Kertesz's direction. The Decca label coupling of Dvorak's REQUIEM and Kodaly's PSALMUS HUNGARICUS is another fitting tribute to a superb artist too soon departed. In addition to Bartok, Kertesz was an indefatigable champion of works by Stravinsky, Henze, and Britten. Britten's BILLY BUDD was first presented to German audiences under Kertesz 's baton and he directed the first performance of the WAR REQUIEM heard in Vienna. For Ravinia Festival audiences, Kertesz directed the WAR REQUIEM with the Chicago Symphony Orchestra & Chorus shortly before his death. With soloists Phyllis Curtin, Robert Tear, and John Shirley-Quirk, the conductor's shattering interpretation left audience members limp." "A Czech by birth, Rafael Kubelik left his homeland after the Communist takeover in 1948 and lived in London for several years before settling in Switzerland. He became a Swiss citizen in 1973. He was the son of Jan Kubelik, one of the great violinists of the early 20th century. Mr. Kubelik was a regular guest of the New York Philharmonic until heart disease and severe arthritis forced him to retire from conducting in 1985. His performances were considered highlights of the concert season by those who prized a warm, probing, grandly scaled style of music making that was quickly being eclipsed by a more streamlined, modern approach. He conducted a broad repertory, and championed many modern works during his nearly five decades on the podium. 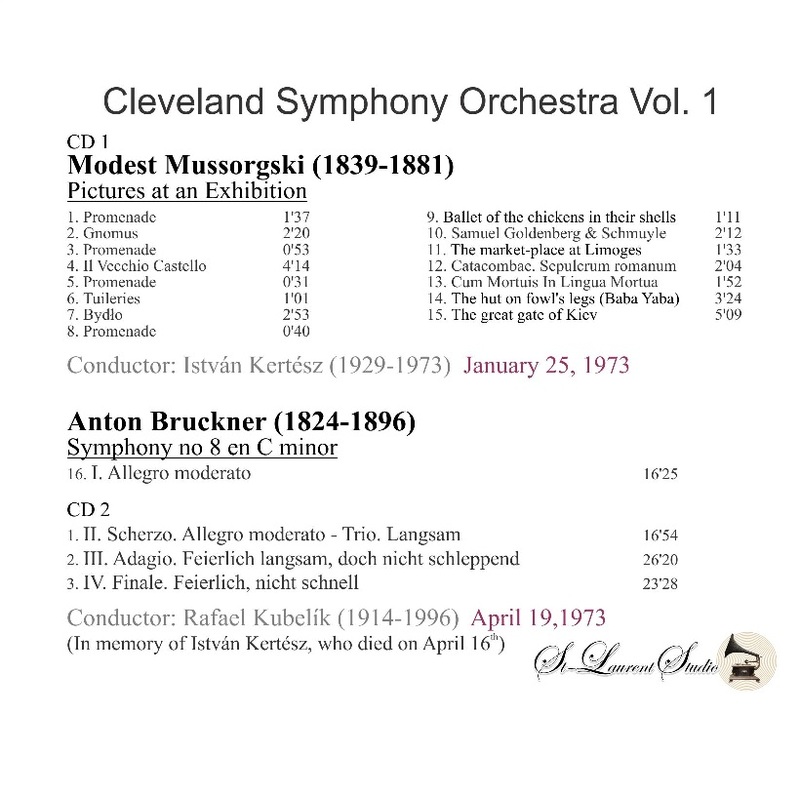 His performances of Czech works, like Smetana's patriotic MA VLAST and the Dvorák symphonies were especially authoritative, and his 1971 recording of the Smetana with the Boston Symphony Orchestra is considered by many to be the best version available. But Mr. Kubelik avoided specialization, and near the end of his career, he devoted himself with increasing vigor to the Viennese classics. The accounts of the Mozart and Haydn symphonies that he recorded in the early 1980s, for example, defied the trend toward light-textured, chamber-scale readings. Using the full weight and coloristic resources of the modern symphony orchestra, he gave performances that have a freshness and energy that transcend interpretive fashion. In 1971, he accepted an invitation from Goeran Gentele, the general manager of the Metropolitan Opera, to become the company's first music director. Gentele died before Mr. Kubelik's tenure began, with a performance of LES TROYENS in October 1973, and Mr. Kubelik faced criticism for spending too much time in Europe and for being a weak administrator. In February 1974, five months after his début as director, he submitted his resignation. He was succeeded by his deputy, James Levine. After 1985, Mr. Kubelik conducted only once. Having declared when he left Prague in 1948 that he would not return until the situation changed, he went back in 1990 to conduct MA VLAST at the opening of the first Prague Spring Festival after Vaclav Havel's Velvet Revolution. Mr. Kubelik had conducted the work 45 years earlier to celebrate the liberation of Prague from Nazi occupation."